April 6, 2019: ACEDA Bank Lao Ltd. 'ABL', the bank you can trust the bank for the people and vision to be the leading SME bank in the Lao PDR, celebrates its 11th anniversary during New Year Season to wish the customers over 2.6 million of ACLEDA Bank in the operational countries "Cambodia, Lao PDR and Myanmar" and the people around the world. Ranged No. 1 commercial bank in term of the contribution of Laotian employment in the sector, ACLEDA Bank Lao with over a thousand management and staff from 39 branches offices ritualizes the New Year in 15 provinces and cities, among 18, of the Lao PDR. Lao New Year is very special for the people. Each New Year is a new opportunity to wash away bad things that happened in the past year, to make merit and give oneself a chance to make coming year way better, cultivating more goodness and purifying one's mind. Managing Director and CEO of ACLEDA Bank Lao Ltd., Dr. Hay Svay, raised get ready to say "Sok di pi mai" or "Sabideepimai" to all of Lao friends all over the world, because the coming week is devoted to celebrate New Year in Lao. I would thank and warmly wish all loyal customers of ACLEDA Bank over 2.6 million, partners, and in particular, the government, authorities, and the Bank of the Lao PDR for value advise and support always and the shareholders, BOD, management and colleagues at all levels for valuable contribution, commitment, and compliant teamwork. "TEAM: Together Everyone Achieves More" to grow together, He adds. Mr. Lamphan INSOULIVONG, Head of Administration of ACLEDA Bank Lao, said Lao New Year is the most widely celebrated and it is the unique and famous festival in Laos. 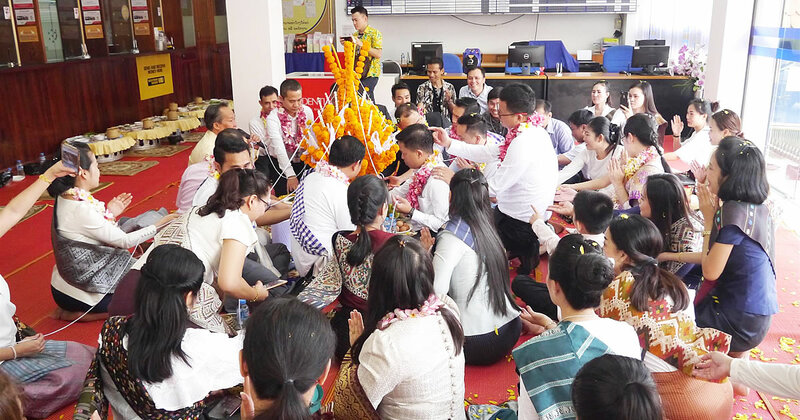 In order to arrange the celebration with happy entertainment, keep solidarity and participate to prevent good tradition and culture of Lao, the Bank arranges to decorate offices to warm welcome guests, give alms, greet Basic Ceremony, play the Laotian traditional game and have healthy food and beverage with enjoying Lao dancing party. Additionally, he takes this opportunity to wish all management and colleagues and their families the good health, happiness and achieve all the duties for the year. Regionally, ACLEDA Group has ACLEDA Bank Plc., as parent company, and five subsidiaries operating in Cambodia, Lao PDR and Myanmar and serving remittance services worldwide. The Group has total assets about USD 6 Billion and operates in 310 branches-offices, 578 ATMs and serving over 2.6 million customers using the commercial bank's products and services. Thanks to the advance technology, Fin Tech Mobile App., well known as "ACLEDA ThanChai", is enabling ACLEDA Bank Lao to serve more active customers in all segments of the community to undertake the transactions and remittance any day, anytime, anywhere.